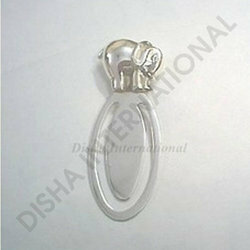 we are manufacturer and exporter of sterling silver bookmarks in different designs and shapes. 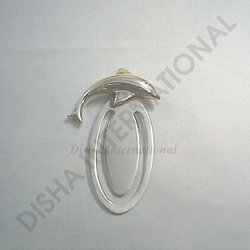 Many options of bookmarks are available with us in different shapes, be it oval, round or any other shape. Horse head bookmarks are specially deisgned for men and boys. we can also customize any shape or pattern provided by you. Bookmarks are a good gift for students of any age, children, friends or grand parents. Being a highly effective, lean and fast-moving organization, we are highly instrumental in providing an extensive array of Sterling Silver Elephant Book Marks. Our provided book marks are manufactured under the guidance of experienced professionals by utilizing optimum quality silver and sophisticated technology. We can provide our bookmarks with various specifications and customized options. Apart from this, our clients can avail these book marks from us nominal prices. We are offering customized products. By keeping track of current market development, we are offering an excellent range of Sterling Silver Book Marks. These book marks are useful for several types of applications. The offered book marks are manufactured by using fine quality silver and cutting edge technology by our proficient professionals. Our provided book marks are highly appreciated for their excellent quality standards. 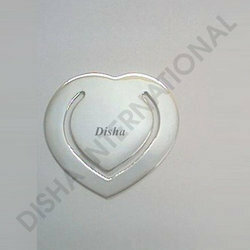 Further, we provide these book marks in various sizes and thickness as per the requirement of our customers. We are offering customized products. We have earned a sterling reputation in the industry for manufacturing, exporting and supplying Sterling Silver Dolphin Book Marks. We provide supreme quality book marks which are well known in the industry for their reliability to meet the clients demand. The offered book marks are manufactured by using quality assured silver and ultra-modern technology. Additionally, these book marks are available in the market as per customers’ needs. We are offering customized products. 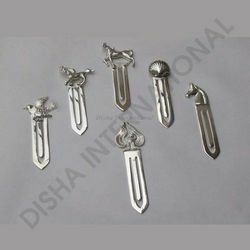 Our company has risen to prominence in the field of manufacturing, exporting and supplying of Sterling Silver Bookmark which is an exclusive gift to a student, child, friend, or your elders. We have many different designs and patterns of bookmarks available The offered mark is made of sterling silver. We are offering customized products as per buyer's specifications. Offering Sterling Silver Heart Book Mark with which you will always love what you read while using this bookmark. A special gift for your loved ones at any occasion or any day. We are majorly looking for enquiries from U.K, Europe, USA and other international markets. We are offering customized products. Silver bookmarks can be presented on any occasion be it a birthday, anniversary, friendship day or whenever you feel to shower love to your near and dears. silver bookmarks are made in various styles using different figurines of birds, animals, fairies and different objects of repute. They can also be made as per buyer’s choice. Offering Sterling Silver Bookmark to our valuable clients. 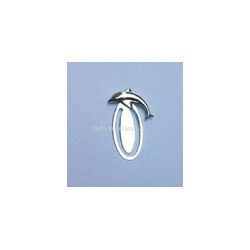 We are manufacturers and exporters of sterling silver and silver plated Dolphin bookmarks. We are offering customized products.Sterling Silver Book Marks are very economical though precious gift to be presented to our friends, young ones, school going kids or grand parents who are fond of reading. Silver bookmarks can be presented on any occasion be it a birthday, anniversary, friendship day or whenever you feel to shower love to your near and dears.